I'm sure that everyone has heard of Hotel Chocolat and if you haven't, where have you been?! Hotel Chocolat is a British chocolatier who opened their first retail store in 2004. Not only do they make chocolate, but they grow their own cocoa too! With Easter less than a month away, they've brought out a pretty impressive collection of Easter Eggs and other chocolatey gifts. 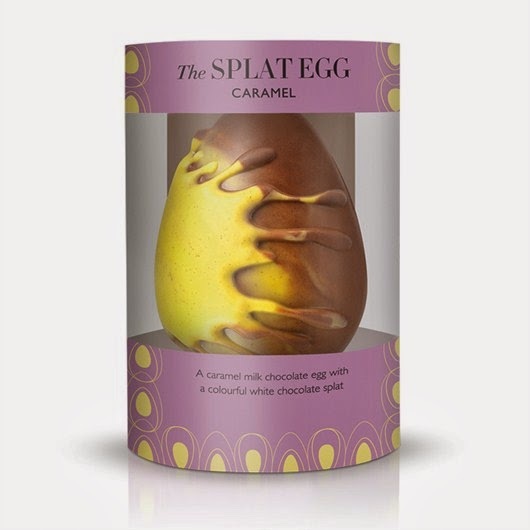 Hotel Chocolat very kindly sent me out an item from their Easter collection; The Splat - Caramel Chocolate Easter Egg. I love caramel and I love chocolate (what woman doesn't?) so I knew that this would be a winner. The egg is made from really thick chocolate but is soft enough to break easily. The chocolate itself is seriously creamy and has a great caramel kick. It is quite rich so don't try to eat the entire egg yourself in one sitting, something that I definitely didn't try *whistles*. It may seem like a pretty expensive chocolate egg but it really is worth it for the quality. This egg is suitable for vegetarians too, it's alcohol-free and contains milk and soya. You can purchase this egg at the Hotel Chocolat website or in stores for £12.50 (150g). You can also follow them on Twitterand Facebook.